With 100 percent of the vote in, Obama won 61 percent to 38 percent for Clinton. The victory netted Obama just two delegates (7 for Obama, 5 for Clinton). The win was expected, as Obama has dominated most of the small-state caucuses during the nomination fight. His 59 percent of the vote -- if it holds -- would be slightly under the sorts of vote totals Obama wracked up in caucuses in places like Alaska (74 percent), Kansas (70 percent), North Dakota (61 percent) and Idaho (79.5 percent). Of the remaining nine states left to vote, none will hold caucuses. So, two delegates, a lesser margin than in several other of his caucus wins and there are no caucuses left. I doubt it will sway any superdelegates. Final Update: 100% now in, Teton went for Obama, final delegate count, Obama 187.5, Hillary 129.5, Uncommitted 2. Update: Obama wins Sheridan, only Teton left, and that should go to Obama as well. Update: I think I've found the answer as to why the race hasn't been called by CNN, thanks to McJoan and Pocket Nines at Daily Kos. Four counties start caucusing in 5 minutes at 2:00 pm MT. One starts at 3pm. 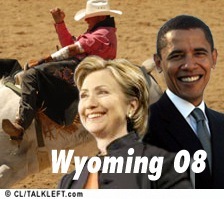 That's it for me, I'm willing to call Wyoming an Obama win. Wyoming caucuses convene tomorrow morning. 12 delegates are at stake. Hillary, Bill, Chelsea and Barack Obama all have campaigned there this week, with Hillary and Obama each making two appearances today. Denver's Rocky Mountain News had reporters live-blogging the appearances all day and evening. They drew large crowds and while Obama is expected to win the caucus vote, Hillary should make a decent showing. One joke Obama didn't tell today: the one about Cheney being his cousin. A story about Hillary that did come out through one of those introducing her: Hillary has eaten reindeer. Wyoming is pure Cheney country. The chances of the Dems taking it in November are nil. But, it's exciting to see both Hillary, Obama, Bill and Chelsea in western mode. This is an update to my late night post last night, which at the time seemed just an amusing late night tidbit. The number of registered Democrats has grown by more than 1,000 since the start of the year, the secretary of state's office says. Republicans have 136,000 registered voters, compared to 59,000 Democrats.